Thyme-Rubbed Salmon with Cauliflower "Risotto"
This Thyme Rubbed Salmon with Cauliflower “Risotto” will become an easy weeknight dinner favorite. The salmon is resting atop a bed of cauliflower rice, making it low carb and healthy! Post contains affiliate links, full disclosure on sidebar. Cauliflower is a strange beast of a vegetable, isn’t it? Nothing shy about it. It has big bold flavors that you either love or your hate, kind of like broccoli and beets. When I was little, I ate it either covered in cheese sauce or raw, dipped in ranch dressing. The whole object of eating it was to have something masking most of it’s flavor. Then I grew up and discovered all the wonderful ways you could eat cauliflower like Roasted Cauliflower, Sage and Almond Risotto and Roasted Cauliflower and Bread Salad. I stumbled upon Thyme-Rubbed Salmon with Shallots and Caramelized Cauliflower “Risotto” in One Pan, Two Plates: More Than 70 Complete Weeknight Meals for Two I thought it sounded interesting and I liked the idea of serving it out of a cast iron skillet. I imagined that it would look rustic and gorgeous. And, it did! I would have made this dish again just because I like looking at it, so the fact that it is delicious is an extra bonus. This was so easy and really and truly you can have this gorgeous dinner on the table in 30 minutes. Mr. Sidewalk Shoes raved about it. Serve this with a green salad and you have an easy one pan meal. For this recipe you are going to want to chop your cauliflower with a knife or you can use your favorite food processor. You can use any skillet of course, but a cast iron is my choice. This low carb recipe is all in one pan and so easy! Pat the fillets dry and sprinkle all over with salt and pepper. Sprinkle the thyme on the fillets and pat it lightly with your fingers so that it sticks. Heat a 12-inch cast iron skillet (if you don't have one - get one!) with lid over medium high heat and add 1 tablespoon of the olive oil. Add the salmon and cook until browned on the first side and then flip. About two minutes per side. Transfer to a plate. Add the shallots to the pan and saute for about 30 seconds. Add the cauliflower, 1/4 teaspoon, a few grinds of pepper and the remaining 2 tablespoons of olive oil and toss the cauliflower to coat with the oil. Brown the cauliflower for about 3 minutes without disturbing it. Flip and cook the other side also undisturbed for about 3 minutes. Taste and adjust the seasoning. Pour in the cream and give it a stir (scraping up the browned bits). Top with the fish. Cover and cook over low heat about 2 more minutes. Mound the cauliflower "risotto" into two warmed shallow bowls and top it with the fish. Garnish with the thyme. Looking for more salmon recipes: Salmon with Ginger Quinoa, Edamame Brown Rice Bowl with Salmon and Grilled Salmon with Tomato Caper Vinaigrette. I love that cauliflower makes such a wonderful sub for rice. This looks super tasty! I love salmon, and I’m a big cauliflower fan too. I like that shallots are used here, and a touch of cream. What a great combination! Risotto gets my heart palpitating with excitement. Love risotto!! I do like cauliflower but I’ve never tried it in a risotto type recipe. This has my curiosity up and I really anxious to try it. It certainly would be a lower calories alternative. This looks delicious. It is perfect for keto diets, too. Love a one pan meal, and thyme is the perfect herb to go with salmon – well, with everything, but *especially* salmon! Just a lovely meal all around! I used to see cauliflower as broccoli’s discolored cousin. Then I found it holds its shape better, tastes better (to me) and it’s so much more versatile. I love this dish. Next weekmight dinner for sure! I am all about cauliflower lately, and I’ve had it on my list to try it as a “risotto”. I think this is the one! Thanks for the inspiration! This looks like such a wonderful dish!! I love the cauliflower “risotto” – it’s definitely the hot vegetable of late. And it’s a healthy, low-fat meal that looks to have wonderful flavor, too! I love seeing cauliflower become so popular. It really deserves to be a superfood. Love that this is a one skillet meal too. I too have just discovered all the many ways that you can use cauliflower. I just recently made cauliflower rice and my husband actually thought it was regular ol’ rice! I will have to give this version a try! I used to HATE cauliflower but it’s definitely growing on me. I still can’t eat it raw though! I guess it’s a texture thing. This salmon looks awesome! Thyme is my go-to herb. I love cauliflower and I love risotto! We just went out for our anniversary dinner to a favourite restaurant and I told myself I would not get the risotto (which I get every time.) Well, I could not break habit! I will have to try my risotto with cauliflower! I never really cared for cauliflower until I realized how versatile it is. I eat it much more now that I watch my carbs. This dish is another one I can turn to for quick and easy dinner. Thanks! I love salmon and cauliflower. I’ve never cooked cauliflower in this way but it sounds creative and very comforting. 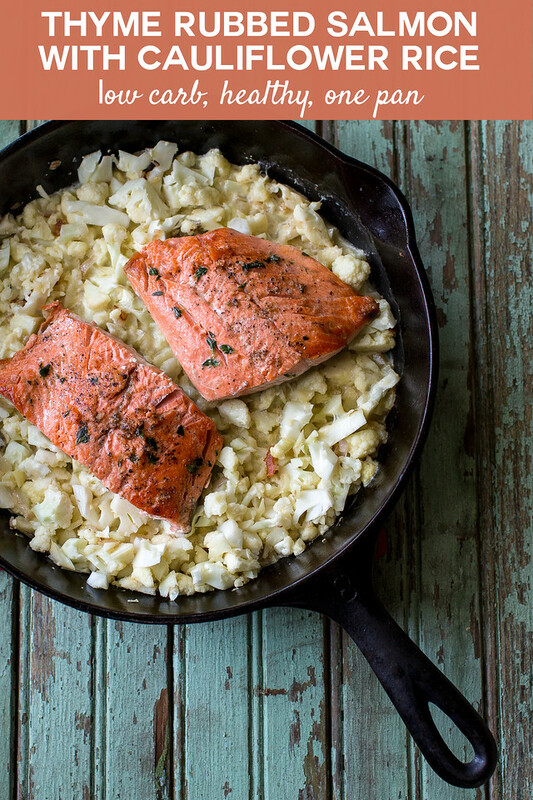 salmon doesn’t do it for me, but i’m digging the cauliflower preparation–what a great idea! The cauliflower substitutes are all over the net but I’ve never tried them. This one takes my fancy though and I love a piece of grilled salmon. I’m a huge fan of cauliflower! I love the way it has become so much more popular in recent years. I would never think of pairing it with Salmon but it sure does look like it works. The notion of cooking it in a cast iron pan is most appealing. Thank you so much for sharing, Pam. It look delicious! Ooo! It really is quite gorgeous. And I love the idea of a cauli risotto. Way more exciting that plain old cauli rice.